The interloan service is available for current staff and students to support their UC related research, study or teaching requirements and is available to request items such as books or journal articles not held by UC Libraries. This free service is not available for personal requirements. Please note if you require an item for long term you can make a recommendation for the library to purchase the item for its collection. Our new interloan system is here! Log in to your old account to see your pre-December 4th interloan request history. Read the New interloan system FAQs and How do I request an interloan? section to find out more. See the Interloans service information below for what can be requested, when interloans arrive and more information. How do I request an interloan? Before requesting an interloan, we recommend you first search MultiSearch and Google for available full text. If unsuccessful, follow the process below. In Multisearch - select Add Results beyond your library's collection at the top of the screen to bring up more options. If we don't own the item, click on "Request an Interloan" in the item details screen. 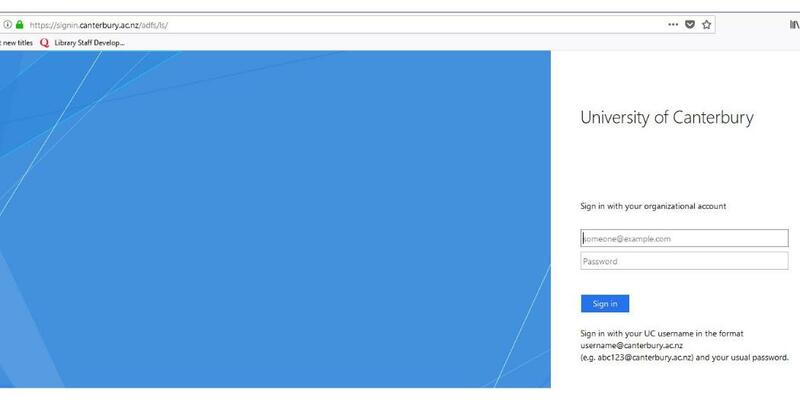 This will take you to a login page (unless you are already logged in)‌‌. You'll be taken to your interloans account and a request form will be prefilled. Edit the details as required, fill in required fields (marked *) and click Submit Request. I can't find my item in Multisearch - how do I request it? Blank request forms can be found in your interloans account. Login to your interloans account. Under "Interlibrary Loan Requests" click on Create Request. 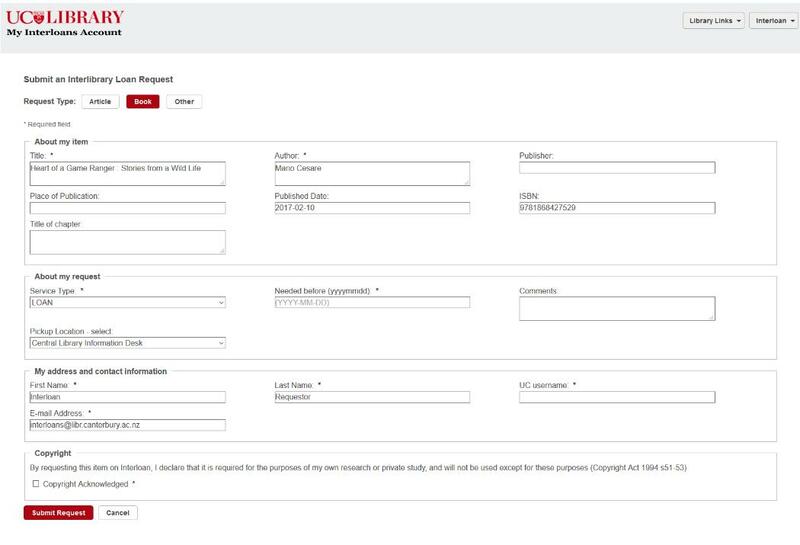 Select the appropriate Request Type, fill in required fields (marked *) giving as much information about the item as you can and Submit Request. How do I access my new interloans account? Access your interloans account and request forms via https://canterburyuni.account.worldcat.org/profile. Log in with your UC login in the format username@canterbury.ac.nz e.g. abc123@canterbury.ac.nz and your UC password. What do the different statuses on my requests mean? Submitted A request you have made, not yet actioned by staff will show initially as Unknown for about one minute before showing as Submitted. Available to view This is a PDF uploaded to your account, ready for you to download. You can view this PDF up to 5 times before the link will expire. In transit ‘Shipped’ to us by a supplying library. This has not yet been received by our library. Due date The due date given by a supplying library for a loan of a book. The due date will display as soon as a book is marked ‘received’ by staff. If you haven’t yet received a notice that it is available, it will likely be being sent to a library for you to collect, or will appear on the Central Library hold shelf later in the day. Item due back This book is either overdue or recalled and can’t be renewed. You may not see a button to renew. Complete A book you have had out that has been returned (won’t show as ‘returned’). Or a request that is otherwise completed eg an open access article that you have been notified by email is freely available. How will I know when my interloans have arrived? You’ll be sent an email notification. Can I change how I am notified of interloans? You will be sent email notices for interloans. You can also choose to opt-out of all interloans notices (Do not send library account updates to me). However, we advise against this as this is how we communicate recall notices, overdues, and important messages related to your requests. NB: this option will only opt you out of Interloan nofications not standard library notices. How can I request a renewal of my interloan? In your account, a button to renew should appear beside the request you want to renew. This sends a request to renew straight to the library that loaned it to us. The due date in your library account will just display the same due date (not “requested to renew” etc. ), until that library has approved or denied your request – this may take up to 1-2 days. Can I cancel my Interloan request? In your account, a button to cancel should appear beside the request you want to cancel. If it doesn’t, it may already have been posted to us – but you can still cancel by contacting interloans staff. Why do I see an error message when I log out? If you try to log out and see an error message, please disregard the message and close your browser down. This is a known error that will be fixed. Almost anything – except some DVDs and very recently published books. We are only able to interloan items related to your current UC research or teaching. Public libraries do offer interloans for personal requests. Articles and chapters usually arrive within 1-5 days, books about 1-6 weeks. It may take longer depending on suppliers and whether an article can be sent electronically or by post. Due to staff constraints an urgent service is not offered. However if you have a tight timeframe let us know, and we'll do our best. You can track requests by using the system-generated Request ID. If your item is delivered as an electronic document a link to it will display in your account. If you get any errors, contact the interloans team. You must select a pickup location for books, print copies of articles, and reference only. You will be notified when your interloan arrives. Reference-only microforms will be available at the Central or Macmillan Brown Library. If your contact details have changed, please update them on myUC (students) or contact HR (staff). These should update across the system within 24 hours. Contact Library staff if you have any problems. The loan period for books and reference only items is set by the lending library with these items usually available for 2-3 weeks. Books and reference only items can be recalled at any time. Please do NOT request a renewal on your interloan until just before the item is due, so that you can get the longest possible loan extension. Click on the 'renew' button next to the book in your Interloans Account. Warning - the due date will only be updated once approved by the library that loaned this. If a 'renew' button doesn't appear, please contact interloans staff. Items may be recalled at any time. Overdue items will incur fines. If an interloan has only just been received when it is recalled for immediate return, the item will, when possible, be resupplied. No more than one article from an issue of a journal may be obtained, or two articles if they are on the same topic. Individuals who are not a University of Canterbury student or staff member may not use the interloan service. Please contact your institutional or public library to place your request. Email the interloans team at interloans@libr.canterbury.ac.nz, or phone 369 3399 (within UC ext. 93399) during office hours weekdays.